Scot Thomas Softball Camps LLC! 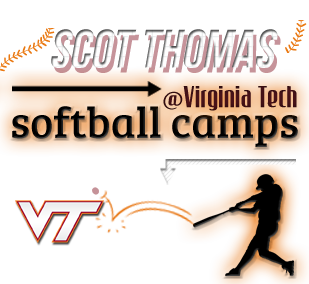 This sports camp is owned, controlled and operated by Scot Thomas, the head softball coach at Virginia Tech. The word “Hokie(s)”, or any other reference to Virginia Tech are by permission of the University, and do not indicate, express or imply in any fashion involvement of the University in the operation or control of the camp, whose sole operator is Scot Thomas.